Darling Harbour is the place to be this festive season, with a host of events on the agenda to embrace the true spirit of Christmas. From shopping to entertainment and fireworks, here’s an insight into Christmas at Darling Harbour. Twinkling lights twinkling amidst the beauty of the harbour are just one of the attractions set to make Christmas a truly special occasion at Darling Harbour this year. 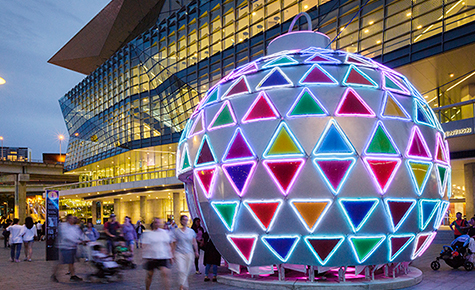 From November 23 until December 23, the entire Darling Harbour precinct will be lit up with colourful displays and dynamic projections, while a dazzling 6m Christmas bauble will be the centrepiece at the ICC forecourt. Grab a bite to eat, relax and unwind as all the festive family movie favourites play out on a big open-air screen each night from December 20 until December 23. The stellar cinema line-up this year features two movies each evening including The Polar Express and The Santa Clause on December 20, The Grinch who Stole Christmas and Jingle All the Way on December 21, Miracle on 34th Street and the Nightmare Before Christmas on December 22, and The Christmas Carol and Elf on December 23. Running throughout each day from December 10 to December 14 are the Daring Harbour Christmas Markets. The perfect place to stock up on stocking fillers or unique gifts, the Christmas Markets are held in the newly opened Darling Quarter Civic Connector. Add some craft to your Christmas celebrations with free craft making workshops running each day from December 18 to December 24 between 11am and 4pm. Projects include decorating your own Christmas baubles and making papercraft decorations. Each weekend evening from December 1, and then every night from December 20 to 24, the Cockle Bay Lawn will come to life as an outdoor disco featuring all your favourite Christmas tunes. Dance the night away under the stars and to the backdrop of shimmering Christmas lights. Santa’s crew will be in attendance throughout the festive season, making their way around the bay on weekends from November 24 to December 9 and then each day from December 14 to 24. Every Saturday night throughout December the skies over Darling Harbour will light up with fireworks as part of the area’s Christmas celebrations. Fireworks commence at 9pm over Cockle Bay. After a big day enjoying all the Darling Harbour festivities on offer, relax and enjoy the Christmas ambience at George’s Mediterranean Bar and Grill. We’re celebrating the spirit of Christmas with great hospitality and a fabulous menu the whole family can enjoy.